Add elegant beauty to your home without compromising your budget by choosing luxury vinyl tile as your flooring. This resilient flooring combines the attractive aesthetic of natural materials with the cost-effectiveness of vinyl flooring. When you want a high-performing, great-looking flooring option that will not max out your budget, visit our showroom to browse of selection of luxury vinyl floor tile products. Many homeowners adore the appearance of ceramic, stone, and porcelain tile, but cannot fit the high price tag in their budget. With luxury vinyl tile flooring, you can achieve the same look as natural tile without the expense. Our store stocks a wide assortment of luxury vinyl floor tile styles, allowing you to easily find the right design for you and your home’s needs. Get the strength of natural tile under your feet without the hard texture and chilly feet. 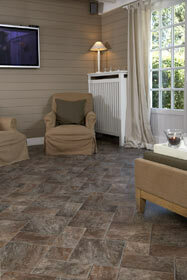 Luxury vinyl tile is extremely resilient flooring and maintains a comfortable temperature all throughout year. The luxury vinyl floor tile brands we carry are known for their durability. When properly maintained, vinyl flooring can look new even after years of heavy use. Caring for luxury vinyl tile flooring is simple. It is almost entirely waterproof, so you do not need to worry about damage from moisture. This makes luxury vinyl floor tile perfect for kitchens and bathrooms. The brands we carry come with a protective layer that allows the vinyl flooring to resist scratches and dents. Luxury vinyl tile is also highly stain resistant. Kids or pets made a mess? Cleaning luxury vinyl floor tile is incredibly easy. Just use mop up the mess with clean water a diluted floor cleaner. Harsh cleaning chemicals are not recommended and not needed to lift most stains. Since this type of flooring does not hold onto dust, dirt, or dander like other materials, sweeping it and mopping it is no problem. If you or one of your loved ones has allergies, you should consider luxury vinyl tile flooring. Learn more about the hygienic properties of vinyl and how to care for it by speaking with our store associates. In addition to luxury vinyl tile flooring, our store also stocks a diverse array of luxury vinyl plank floor. This flooring style replicates the appearance of wood, allowing you to enjoy the appearance of hardwood floors without the higher price and upkeep. No matter what species or strain of wood you are interested in, we sell luxury vinyl plank flooring that is a perfect match. Trust your luxury vinyl tile installation needs in the hands of our store’s team. We have a team of certified installers who are qualified to work with all the vinyl tile and vinyl plank flooring products sold in our store. Save yourself the hassle of doing it yourself or finding another installer by requesting the service from us. For more details on our installation processes and prices, please contact our store. Contact our store for more information on luxury vinyl tile and luxury vinyl plank flooring. We are proud to serve the homeowners of St. Paul, MN.